What Does "Home Security" Mean to You? Does knowing that someone is inside of your house make you feel secure? An alarm simply tells you that someone is inside. It does nothing to stop them. It less than 10 seconds for an intruder to break into a home. How is that possible? Because kicking in your front door is incredibly easy. It doesn't require any tools. Just one swift kick to a door will allow entry to most homes. Kicking in a door is the easiest way to get into a home. Why? Because your door frame is made of thin, soft wood. We don’t sell doors. Since 2004, we have created the world’s most effective door security and repair solutions. In other words, we make your existing doors more secure. Door Armor, is a patented system that reinforces the weak points on your existing doors. 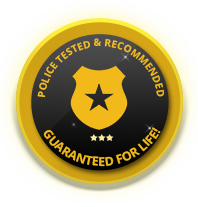 Our solutions are police tested & recommended and can be installed yourself, using only a drill, in under 30 minutes (you don’t need to remove your door).